Optics includes study of dispersion of light. 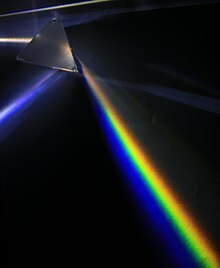 Optics is the branch of physics which involves the behaviour and properties of light, including its interactions with matter and the construction of instruments that use or detect it. (Ptolemy) left in his Optics, the earliest surviving table of angles of refraction from air to water. ...This table, quoted and requoted until modern times, has been admired... A closer glance at it, however, suggests that there was less experimentation involved in it than originally was thought, for the values of the angles of refraction form an arithmetic progression of second order... As in other portions of Greek Science, confidence in mathematics was here greater than that in the evidence of the senses, although the value corresponding to 60° agrees remarkably well with experience. To turn their optics in upon't. Contemporary with Vitellio and Peccam was... Roger Bacon, a man of almost universal genius, and who wrote on almost every branch of science. He frequently quotes Alhazen on the subject of optics, and seems to have carefully studied his writings, as well as those of other Arabians, which were the fountains of natural knowledge in those days, and which had been introduced into Europe by means of the Moors in Spain. Notwithstanding the pains this great man took with the subject of opticks, it does not appear that, with respect to theory, he made any considerable advance upon what Alhazen had done before him. John Trumbull, McFingal (1775-1782), Canto I, line 67.